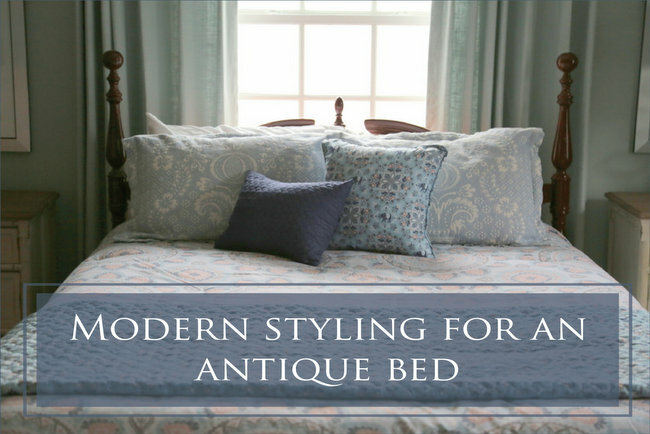 This is the third in a kind of series about decorating with an antique bed. The first was about putting away a bed that I had been sleeping in for 28 years to make way for a new one, the second was about transforming an antique bed with paint, and this one is about freshening up an old bed without altering it at all. The bed you see in the “before” here was painted for the other room, and the “after” here is actually the “before” from the other room. Ok, so we started with a nice blue wall color that gave the space a facelift, for sure! 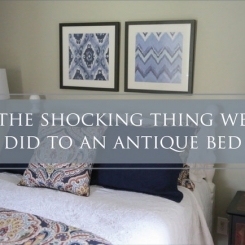 My client wanted to keep the antique bed and the pair of rugs for either side of the bed. 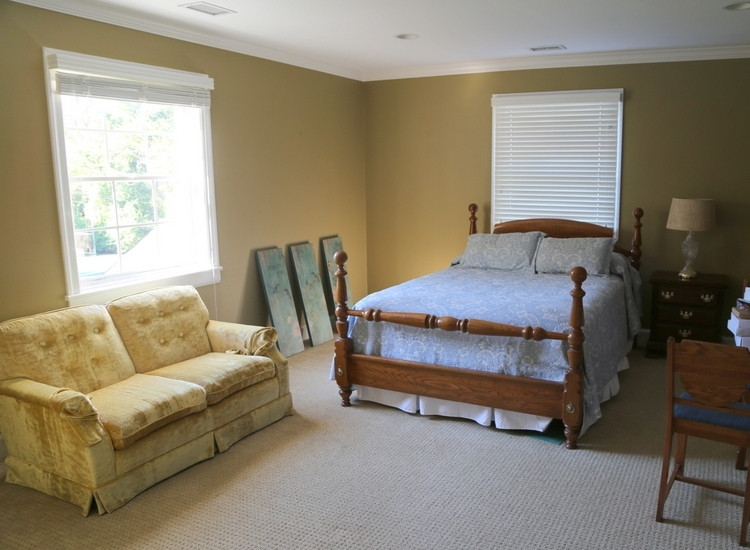 If you have a matching dark wood bedroom suite, it’s really difficult to update the room. Matching bedroom suites are pretty much over. We opted to purchase a pair of fresh new chests of drawers in a creamy finish. This room is quite large, and small side tables would have a poor choice for the scale of the space. The new bedding has a mix of patterns to provide some youth to the older bed. 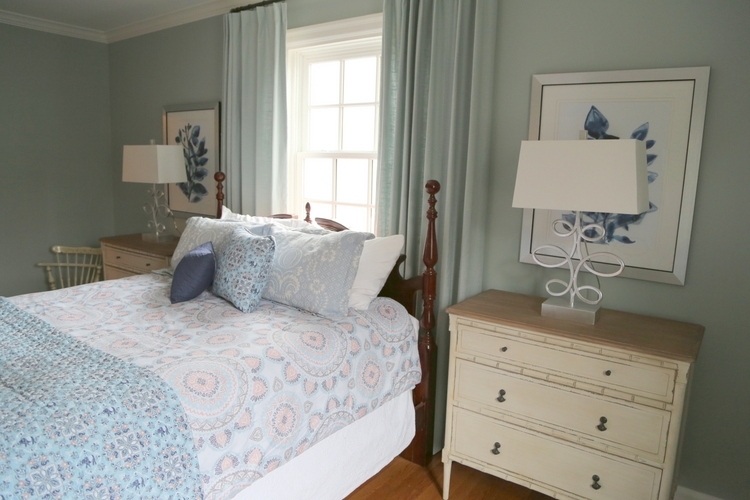 I added a pair of lamps anchored by abstracted art in blues that echo the bedding so that the guest room feels balanced and peaceful. This wall was the most symmetrical one in the room, so I chose to put the bed smack-dab in the middle of the window. The new curtains frame out the bed quite nicely, reminiscent of a partial canopy at the head of the bed. 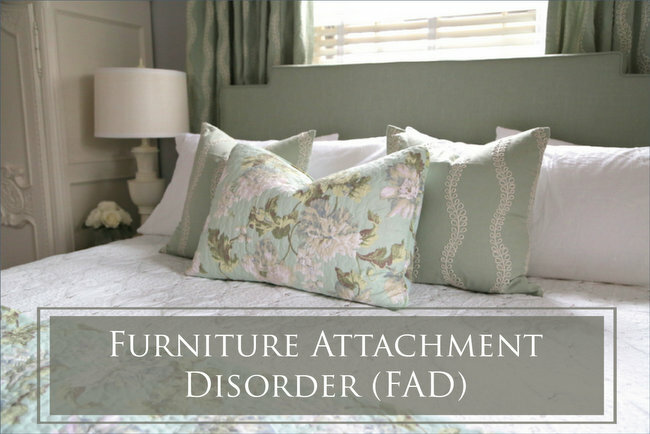 As you can see, if you have an antique bed (or any old piece of furniture), you have several choices: 1) let it go if you don’t love it and embrace something you really want, 2) paint it to transform and freshen it up, or 3) preserve it as-is and lighten up the other furnishings and add modern accents. 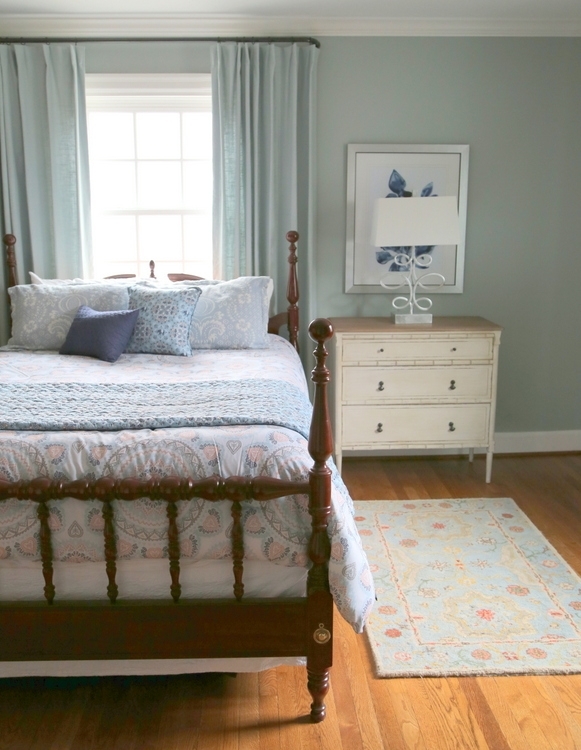 This entry was posted in Design Intervention and tagged antique, bed, bedroom, bedroom design, blue walls, decorating, decorologist, design. I Missed My Convention, So Now What? 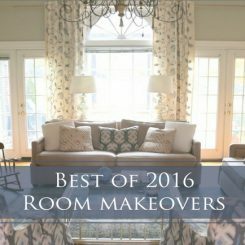 Your room makeover is so fresh and light! Love the blues and the creamy colors. You used one of my favorite curtain rods! Simple, but helps block the light that seeps in on the sides. I have a question: can you enlighten me on placing those beautiful lamps in front of the equally lovely prints? I would choose any of the options you mentioned. It would depend on my needs and the look I was going for. It’s one of those goes-around comes-around things. I ‘ll leave my wood stained instead of painting (if it’s wood worth keeping) – else the next generation will be spending all their time stripping antiques that have been painted, like I did in my 20s after my Grandmas’ generation got trendy and updated everything by painting it. is gone and will never be again. I think just like the mid-century modern furniture it will all come back again and be more expensive this time. I really love the rug and hope you got it at a store I can find it at. Jeannie, thanks for your input! You mean the pair of rugs on either side of the bed? The client already had those – everything else is new except the bed. I love the bed unpainted. I have high beds like that and am always needing dust ruffles that are difficult to find because they are not long enough. I like this look of not going all the way to the floor. Do you know if the white coverlet or whatever it is that is somewhat of a dust ruffle can be purchased or is it something she already had? Thank you. The bedskirt was already on the bed but all the rest of the bedding pieces are new. I actually prefer going without a bed skirt at all when you have wooden rails. Love the bedside tables! Could you share where to find that style? In my unprofessional opinion, I would move those two large pictures from behind the lamps and then put them on another wall, say the wall to the left of the bed. Perhaps place them one on top of the other so they make one long picture. The pictures just seem to get lost behind those beautiful lamps. My choice would be to refinish the wood to a tone that I like. That stain is a bit too red for me, but I wouldn’t want to paint it either. 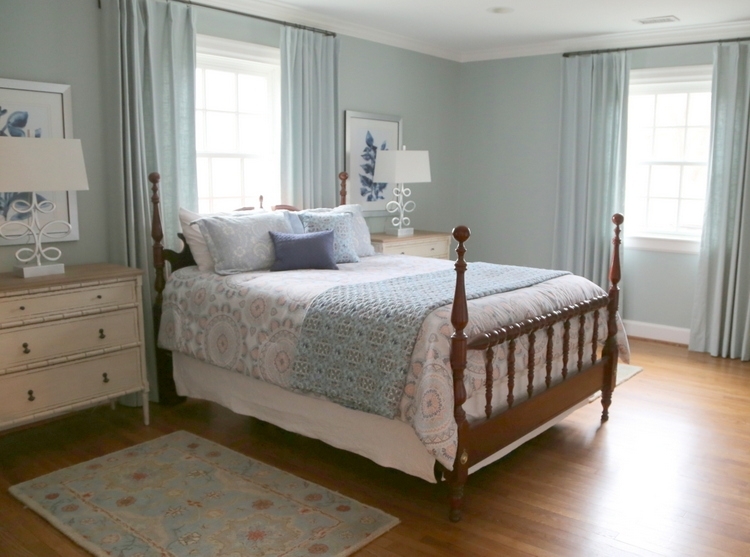 you’ve done a great job transforming the room…its dreamy! Hmm…well, I’ve done all there at one point! Gotten rid of pieces I was given but didn’t love any longer or when I could afford to replace them, painted pieces to update them and kept them as is and worked around them. For me, it depends on the room. 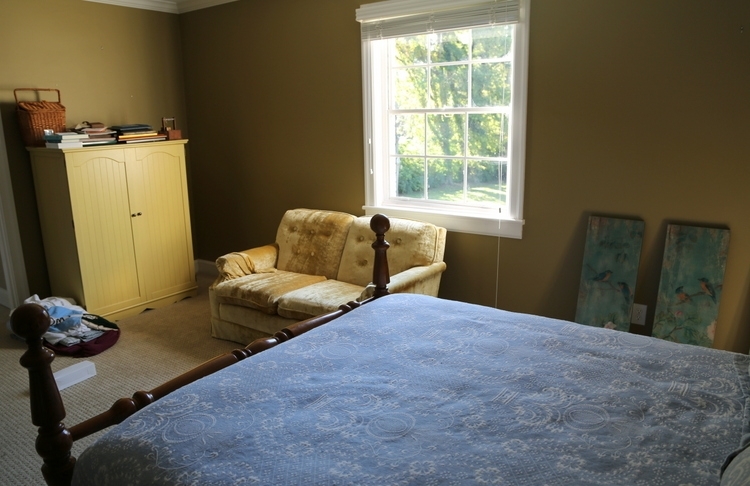 For instance, in a guest room, I would probably not have painted that bed. If I intended to use it in, say, my daughter’s room, I probably would have sprayed it a fun color. Laura, I’ve painted three old twin beds in fun colors for my daughters, as well. It’s a more casual look, for sure! I like the idea of updating a room but keeping the antique objects in the room, I like the way you have mixed the modern look of the room with the old antique bed. I do think that you could have gone another way with the renovation and maybe included a few more antique bedroom ornaments to tie the room together such as a few nice picture frames or a dressing table set. Would you share the paint color please?